There are lots of reasons I love belonging to a CSA. I love the idea of supporting farmers before the season starts, guaranteeing their income regardless of weather outcomes on crops. I love the local aspect, eating food grown so close to my home and in season. The convenience factor ranks really high – produce shows up, without having to go to the grocery store. It’s especially convenient days like today, when weekends away mean we haven’t been to the supermarket in 3 weeks. But hey – a box full of okra and lettuce and corn and nectarines just showed up! But my favorite part of a CSA? Trying things I probably wouldn’t buy otherwise. It’s not that these vegetables are hard to find, per se (well, some are – ground cherries are pretty specific to farmer’s markets and CSAs). But in a grocery store, I often tend to frequent the known when it comes to produce. But then the CSA comes around and gives me a bunch of tomatillos, and suddenly I’m inspired to shake up our normal kitchen routine. I’ll be the first to admit that this isn’t traditional salsa verde, because it contains both tomatillos and tomatoes. So maybe it’s salsa verde-ish. Or salsa verde y rojo. Salsa verde rojizo? Whatever you want to call it, it’s freaking delicious. We split a full CSA share with friends, so we only get half the amount of produce. The first time we received tomatillos, we only received three. I could have made the world’s tiniest batch of authentic salsa verde… or I could throw in some other tomatoes we had and make a tomatillo-tomato salsa hybrid. You can tell which option I tried. The slightly acidic flavor of the tomatillos. Sweet cherry tomatoes. Spicy jalapeno, the bite of onion and garlic. All fire roasted under the broiler until slightly charred, blended together with lime juice and cilantro. I had all these ideas for how I would use the salsa verde, and instead I just ate it with a spoon right out of the food processor. I loved it so much, the next week I requested a bulk order of tomatillos from our CSA. Again, I thought about making traditional salsa verde, but… nope. Somehow those tomatoes found their way onto my sheet pan and under the broiler instead. This time, I at least managed to make enough to use the salsa verde in a few dishes, but even starting with 3 pounds of tomatillos, we used up all the salsa in a week. And this makes a lot of salsa. 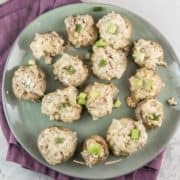 I’d say you could easily go ahead and halve the recipe so you don’t have quite so much… but you should probably make it all. Or you know, go ahead and double it, because it’s addictively good. No chips? No problem. A spoon will do just fine. 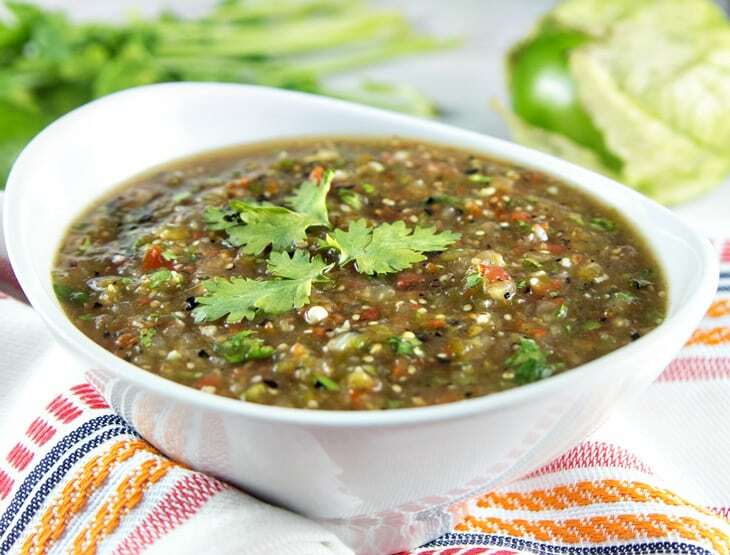 Looking for a way to use your Roasted Tomatillo Salsa Verde? 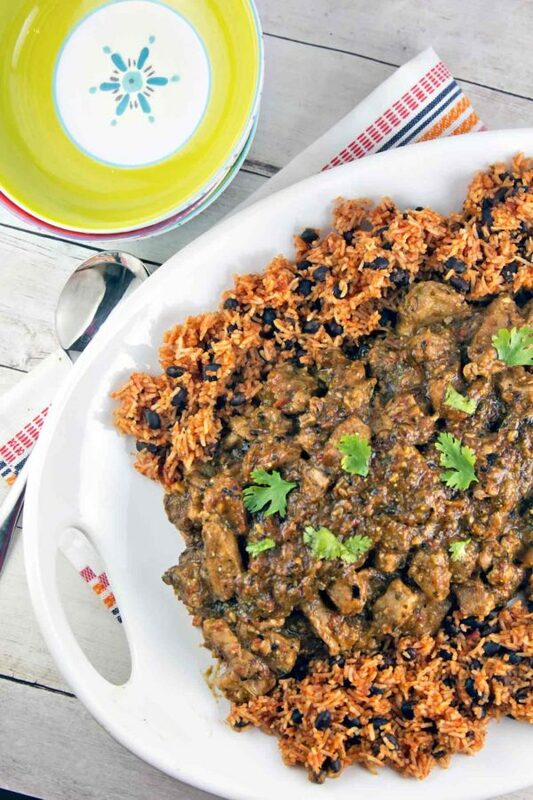 Try this Pork Chile Verde! 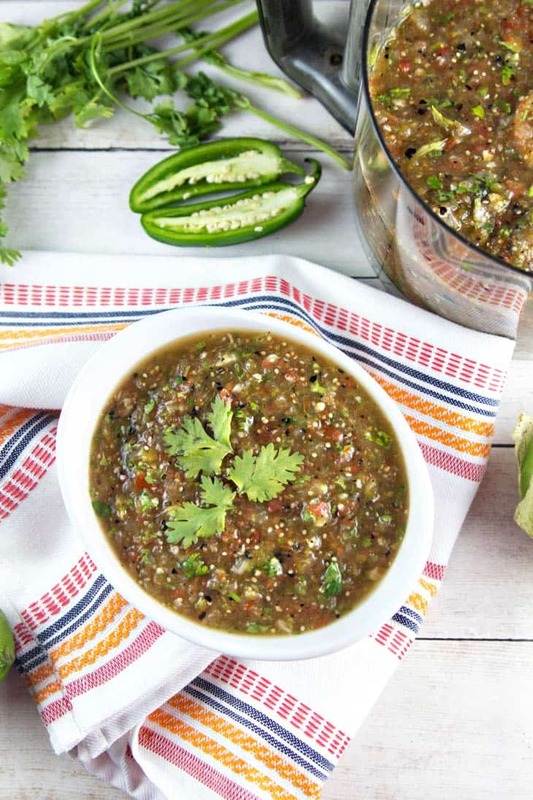 Fire roasted tomatillos and cherry tomatoes pair beautifully with spicy jalapeno, onion, and garlic in this non-traditional salsa verde. Place an oven rack a few inches below the broiler. Set the broiler to high. 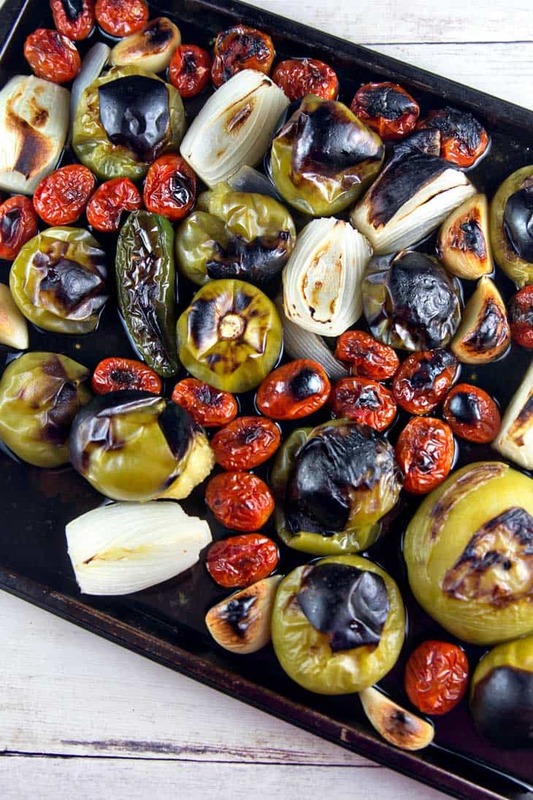 Place the tomatillos, cherry tomatoes, jalapenos, onion wedges, and garlic on a large roasting pan. Broil for 6-7 minutes, until tomatillos and onions start to blacken. Flip ingredients over and broil an additional 6-7 minutes, until everything is soft and charred. If your broiler heats unevenly, slide the pan from one side of the oven to the other halfway through cooking time for each side of the vegetables. Allow the vegetables to sit on the roasting pan until cool enough to handle, about 15 minutes. Remove the seeds from the jalapenos (leave in for extra spicy salsa!). 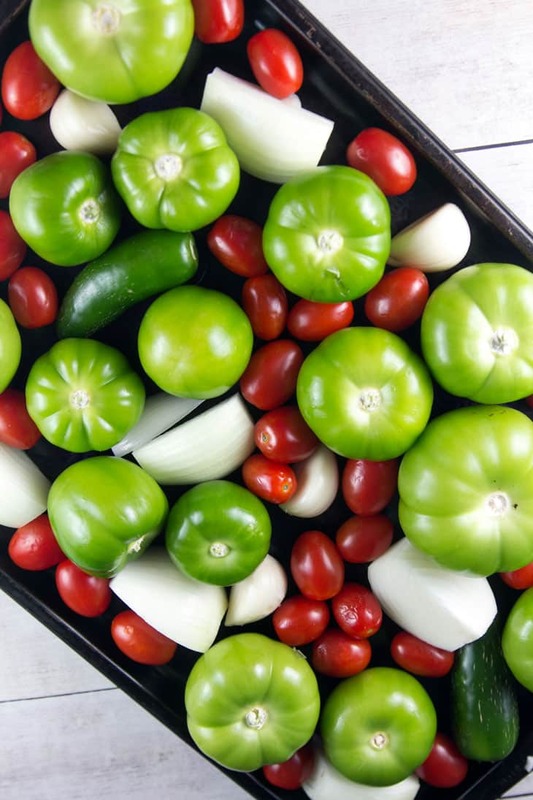 Place the vegetables into a food processor or blender, pouring in the accumulated juices on the sheet pan. Puree until small chunks remain. Add in the cilantro, lime juice, and a pinch of salt, and pulse to combine. Taste and add more salt if necessary. The salsa verde will keep in a sealed container in the refrigerator for up a week. For longer storage, cool in the refrigerator and then transfer to the freezer for up to 6 months. OMG, ROASTED salsa is so amazing. It really kicks the flavor up a notch, hey? Definitely – so much more depth to the flavor than raw! CSAs are the best. It’s always such an adventure seeing what’s going to show up in your latest box. Thanks, Tracy! Agree on the adventure aspect. Some weeks it’s a great adventure… and some weeks it’s rolling your eyes at yet another cucumber. Haha! This salsa looks so amazing! Gonna make some tonight! I can only imagine the delicious flavour of all those roasted vegetables. 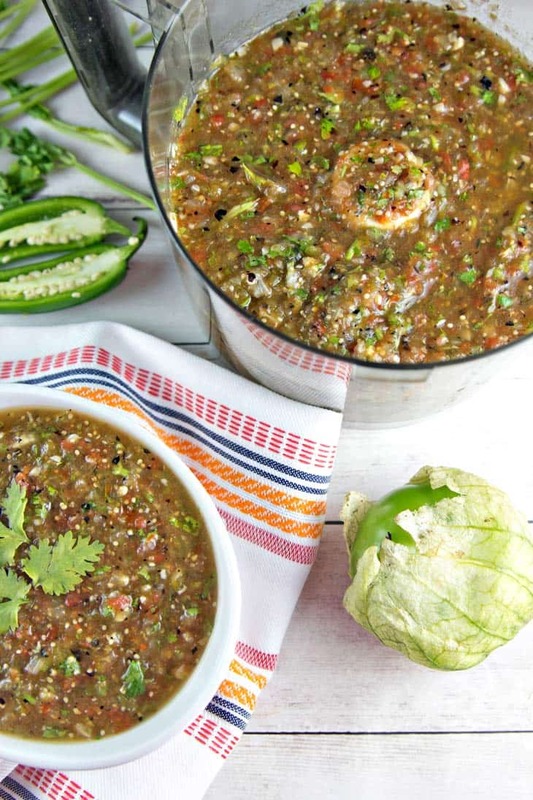 I think I’m going to need to try this salsa verde – I bet it would go on just about anything!! Yes! I have a recipe coming up soon that uses it, but it would really go great with just about everything – fish, steak, a vegan quinoa burrito bowl – the possibilities are endless. 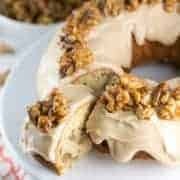 This is a delicious recipe. I had to alter the proportions a little, as my garden has been producing WAY more cherry tomatoes than tomatillos. Still, it was wonderful. This was my first effort at growing tomatillos; had no idea they would grow in NW Wyoming, but I’m getting lots of medium-sized ones. Thanks for sharing. So glad you liked it, Gretchen! I’m so envious that you grow tomatillos in your garden – I had to give up on even the cherry tomatoes in my little patio garden because my dog ate them all right off the vine. This is the perfect recipe to alter proportions… in fact, I received another 3 tomatillos from my CSA this week, so I think my next batch will be heavier on the cherry tomatoes as well. Enjoy all those fresh tomatillos! Wonderful sounding recipe, I will often roast vegetables or fruits to turn into preserves it adds a new level of flavour that I love! Great way to use up end of season tomatoes, plus green salsa is something I love. Ah! CSA = Community Supported Agriculture. You basically buy a “share” of a farm, and get one share of produce each week. You buy in before the season starts, so you’re committing to buying produce from that farm, regardless of what the crop output is that year. It’s a great way to support local farmers because they get the peace of mind of a income. It is, of course, a little bit of a gamble – if there’s a terrible weather event and crops are decimated, you don’t get much for your money. But if it’s a great growing season, the boxes are stuffed full. Because you’re getting whatever the farms grow, you get a ton of variety, which is my favorite part. We get a lot of things I don’t normally pick up at the market! I haven’t seen tomatillos in a little while either, which makes me super sad. I actually just found one lone tomatillo in my produce bin tonight, haha – not quite sure what to do with one! Wow this salsa sounds utterly delicious and so packed full of flavour!! I love salsa verde…live for salsa verde…and now you’re teaching me how to make it. Hallelujah! Can’t wait to try it! This looks awesome! And I love tomatillos! Salsa verde rojizo Is going on the menu. Thanks, Ross! Salsa verde rojizo totally needs to be a real thing. Can we make it a real thing? Food bloggers for Salsa Verdo Rojizo! Oooh, I bet the tomatillos with yellow tomatoes will look gorgeous! 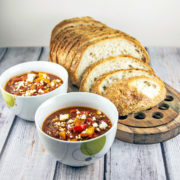 It’s a snow day here in Ct right now and I’m in the process of making this recipe! I am just waiting for the veggies to cool ????? Hahaha I can’t think of a better way to spend a snowday than making some tomatillo salsa. ? Totally jealous of your snowday – we barely wound up with an inch here, so off to work like normal. Sad face. Hi Stephanie – You want to take the papery outer skin off the tomatillos before roasting. No need to rub off the charred inner skin or removed the tomatillo seeds before adding them to the food processor. The salsa has a deep roasted flavor, but does not taste burnt! You will be pleased to know that adding a smidgen of red tomatoes to salsa verde is an authentically Mexican thing to do. My mother-in-law, my sister-in-law, and two of my close friends (all who are Mexican) have each shared their salsa verde recipes with me, and all four recipes have included red tomatoes. Apparently it “cuts” the sourness of the tomatillos. Do you think I could can this? I have never tried canning so I am definitely not a good resource, but I can’t think of any reason why it wouldn’t work. Please let me know how it works out if you give it a try! This is by far one of my favorite salsa recipes. I made it for our life group the last time we had tacos and brought nothing home. The little that was left was requested to be taken. I used four Roma tomatoes because I have people who can’t eat cherry tomatoes and they work great. This is the best homemade salsa I’ve ever made!! It is soooooo good. I added an extra jalapeño because we love things extra spicy and it was delicious!